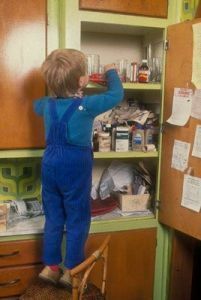 Keep all chemicals and medicines out of sight and reach of children, preferably locked away. Young children can be good climbers, and often surprise their parents by getting things thought to be out of reach. Keep all chemicals and medicines in their original containers, with the label intact. DO NOT store it in a food or drink container. This is an illegal and highly dangerous practice, causing a multitude of poisonings every week around the world. This reduces the chance of accidental poisoning in an adult, and helps teach children that medicines and chemicals are not food. Put any chemicals or medicines straight back in their place of storage after use. A significant proportion of childhood poisonings occur when chemicals or medicines have been left out after use. Dispose of chemicals and medicines that are no longer used. For advice on disposal of chemicals, contact either your National Poisons Centre or your regional council. To dispose of medicines, contact your local pharmacy, they will usually be able to safely dispose of medicines for you. Child resistant caps are not child proof. Keep medications out of reach of children, even if they have child resistant packaging. Choose junior strength or smaller packaging sizes. This can help reduce the chance of serious poisoning if a child was to swallow some. Childhood poisonings often occur when a child is sick. Pay special attention to putting medicines away after use, and never refer to medicines as lollies or sweets. Do not keep the dishwasher door open when not in use. Children will often get into the dishwasher and eat the powder before or after the wash cycle. This can result in serious poisoning.